At Lookaway Farm we are committed to providing a safe and educational experience for those interested in the total equine experience. We provide professional instruction for all ages and levels of experience. Whether you're interested in becoming a serious show ring competitor or simply wish to enjoy casual riding on the trails, we work hard to ensure that every rider reaches their full potential and accomplishes their personal goals. We Specialize in Saddleseat style of riding. Saddle Seat riding is an English style of riding (as are Hunt Seat and Dressage), but it is a uniquely American style of riding used primarily on American Saddlebred , Morgan and Arabian, horses. Saddle Seat riding is done "on the flat" only, (meaning no jumping), they are shown at a walk, trot, and canter, and sometimes at five gaits. Saddleseat riding is all about animation. The horse should have a high head carriage with an arched neck, and lots of "action" or high-stepping feet. The ultimate goal in Saddle Seat riding is a truly thrilling performance. A saddle seat horse should be thrilling to watch; extremely elegant, classy, and stylish. Kathleen is a second generation horsewoman. She has been involved in the daily chores here at the farm all her life and has competed at the national level, accomplishing World Champion status at the age of 16! Kathleen started the lesson program at Lookaway Farm in 2002. She has taught all ages from the beginning stages of riding all the way up to polishing riders for national championships. 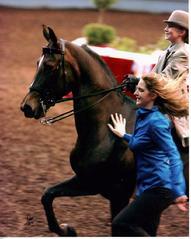 Chrissy is a second generation saddle seat trainer and instructor. She shares our focus on creating a positive and safe learning environment as well as focusing on individual personal goals. Call Chrissy today to set up your lessons at (330) 239 2847!! 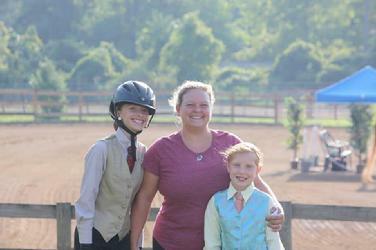 The riders of Lookaway Farm attend shows at the Academy Level for those wanting a taste of what the Horse Show world has to offer. For the advanced rider, we also attend shows on the A-rated circuit at the Regional and National Level. Please call or e-mail us for more information on our lesson program. 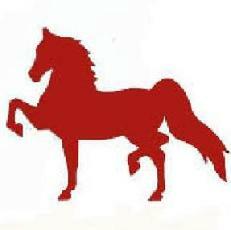 Please contact Kathleen Flower to begin your equestrian experience.